Local fans of "Parks and Recreation" will get a glimpse of their city in the show's two-episode season premiere Tuesday night, the second of which partly takes place in Chicago. In the Chicago episode, Andy Dwyer (Chris Pratt) and Tom Haverford (Aziz Ansari) make their way from the fictional Indiana city of Pawnee to Chicago in a cab to look for Haverford's ex-girlfriend. Haverford, who apparently falls asleep on the long ride, wakes up when the cab stops on Michigan Avenue near the Tribune Tower and asks the driver, "Where the hell are we?" He responds, "Chicago. That'll be $830." So begins the pair's Chicago adventure, which is filled with stereotypes of the Windy City, some accurate and others not, according to a preview of the episode. John McCain Returning to "Parks and Recreation"
After exiting the cab, Dwyer opens his arms and shouts, "Chicago! The Big Apple!" As luck would have it in any TV comedy, Haverford and Dwyer run into the ex-girlfriend, Lucy, right away and tell her they are there because Dwyer got a new job. He says he's the new head coach for the Bulls. When Lucy says they should meet up after work, Tom suggests getting some deep-dish pizza and watching the Bears. Scenes from the rest of the episode take place in Millennium Park, North Avenue Beach and Wrigley Field. All of the Chicago scenes were filmed in a single day in September. 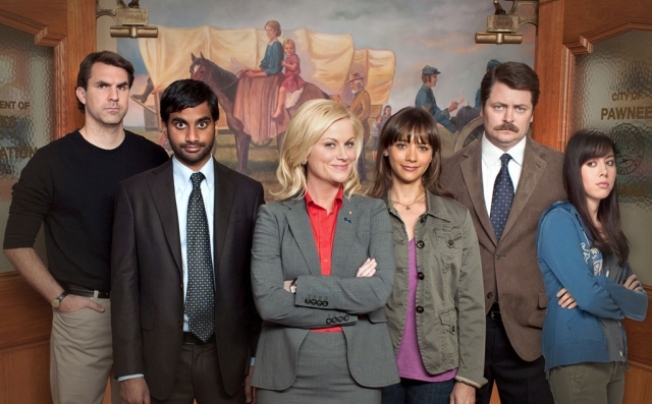 A Future Finale for "Parks and Recreation"
Tuesday night's shows are the beginning of the end for "Parks and Recreation," which is in its seventh and final season.